The title and the star, Timothy Bottoms, may promise a drama in the vein of The Last Picture Show but this is a car chase flick, directed by Jack Starrett who the previous year crossed the chase movie with The Exorcist and came up with Race With the Devil. Bottoms plays an ex-con, returning home to his white trash girlfriend, Susan George, and their baby son. 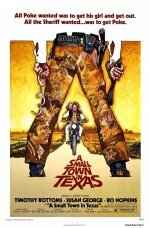 Bottoms also swears revenge on the redneck cop who busted him, Bo Hopkins, which results in a lot of revving up, wasted gasoline and explosions. Aimed fair and square at what Variety used to call yahoo audiences.